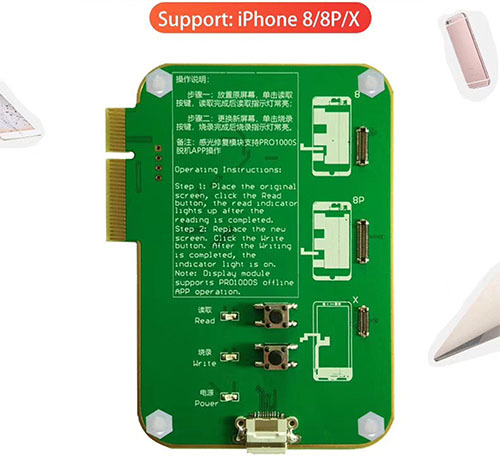 JC ALS Ambient Light Sensor Photosensitive Programmer for iPhone 7/7P/8/8P/X. 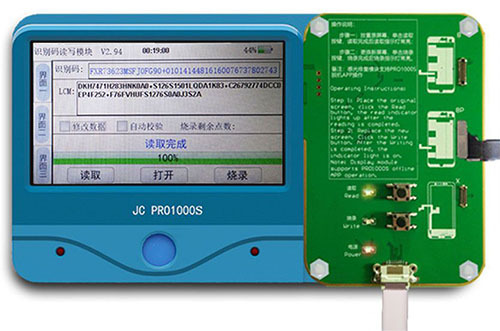 Pro1000S Repair Photosensitive Data Backup Programmer now Come with Three repair functions( Photosensitive / touch / vibration repair). so it come with Three modes of operation: 1. Separate module power supply operation; 2. separate module with computer platform (chip repair interface) read and burn operation; 3. with JC Pro1000S programmer. Step 1: Place the original screen, click the read button, the read indicator lights up after the reading is completed. Step 2: Replace the new screen, Click the write button, after the writing is completed, the indicator light is on. Step 1: Place the vibration accessories, Press the reading button, and the reading indicator will be bright after the reading is completed. Step 1: Connect the original LCD To JC ALS Photosensitive Programmer, Press read button to read the LCD COde, indicator lights to remind done. Step 2: Replace the original LCD with the new LCD< press Burn-on buttom to copy it to new LCD< indictor lights to remind done. 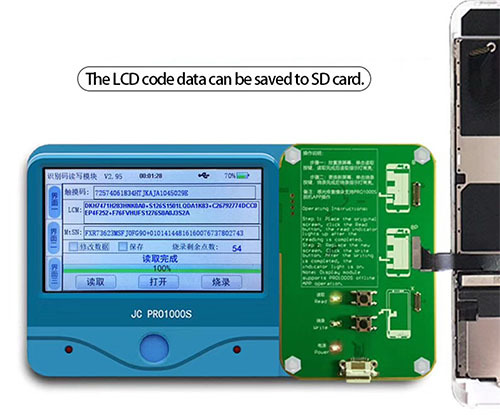 JC ALS Photosensitive Programmer/Touch/vibration repair module can work with JC Pro1000S, The LCD code data can be saved to SD Card. Easier to edit or save data.